Blandford men and Sherborne ladies made the long trip up to Hull to play in the National Superleague Champion's Cup on the 10th August 2014. What a weekend it turned out to be for Dorset. 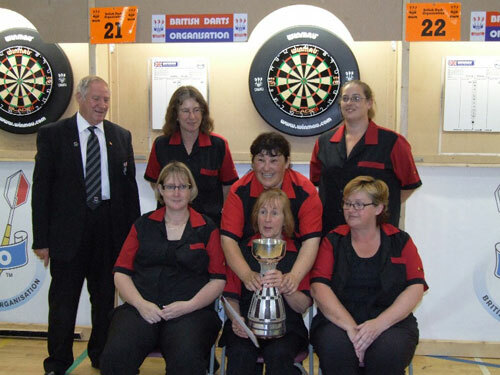 Sherborne Ladies secured the National Superleague Champions title for the second time, having won it for the first time back in 2012. The ladies finished top of their group with wins over Worcestershire 4-1, Gwent 3-2 and Gloucestershire 5-0. They had a close run quarter final against Clwyd 3-2, followed by a semi-final against Hertfordshire with the same score 3-2. This was to set up a final clash against their local rivals Somerset. After the first two games had finished Dorset were 2-0 up, Somerset made it all square with the next two. The last game to finish went to the deciding leg, Cath Campbell kept her cool to hit the winning double to claim the National title. A big mention to all the Sherborne ladies team: Sarah Chick, Becky Dedman, Sally Old, Lisa Prowse, Cath Campbell and not forgetting non-playing captain Jean Renshaw. The men also finished top of their group with wins over Lincolnshire 5-4, Cheshire 6-3, Clwyd 6-3 and Borders 6-3. This gave them a quarter final tie against Glamorgan, after being 4-2 down, a backs against the wall performance saw them winning the last three games to give them a 5-4 victory. This set up a semi-final clash against the mighty Yorkshire. Despite some close games the match ended in a 0-9 scoreline. This is the furthest that any Dorset men's team has finished in this competition, so a big mention must go to all the Blandford team: Dennis Crane, Pete Brundish, Thomas Chant, Eddie White, Gary Park, Simon Whatley, Nick Matthias, Danny Pearce, Davy Cosstick, Sam Sawyer and again not forgetting non-playing captain Trevor Chant.